Today I am blogging about one of my favorite condiments. Yes. 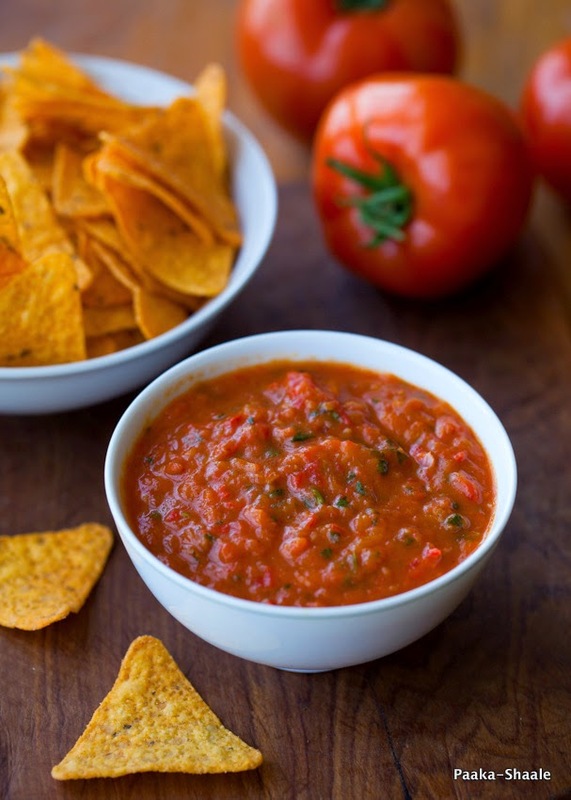 The Salsa happens to be one my favorite condiments these days. I just love the versatility that this dip has to offer. Among the other possibilities, I like salsa in my sandwiches, pizzas, rice and along side corn chips. The versa;city of the Mexican salsa is limit less. Over the past few months, I have developed a special liking to the Mexican cuisine. This liking could be because the mexican cuisine is very similar to the Indian cuisine. 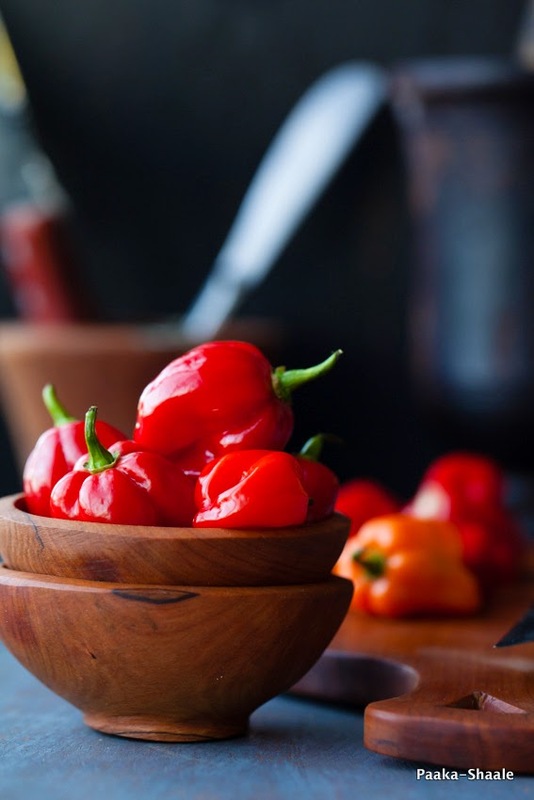 There is a similar use of spices like chilies and cumin. The tortillas bear a close resemblance to our humble rotis. I have even noticed that the Mexican rice dishes are very much like the Indian Pulao. While the Mexican cuisine depends heavily on rice, corn and beans, Indian cuisine is never really complete with out rice and Dal. Coming to this Salsa, let me give you a small warning. For this condiment is not for faint hearted. It would be an understatement if I say that this salsa is spicy. It is fiery hot. 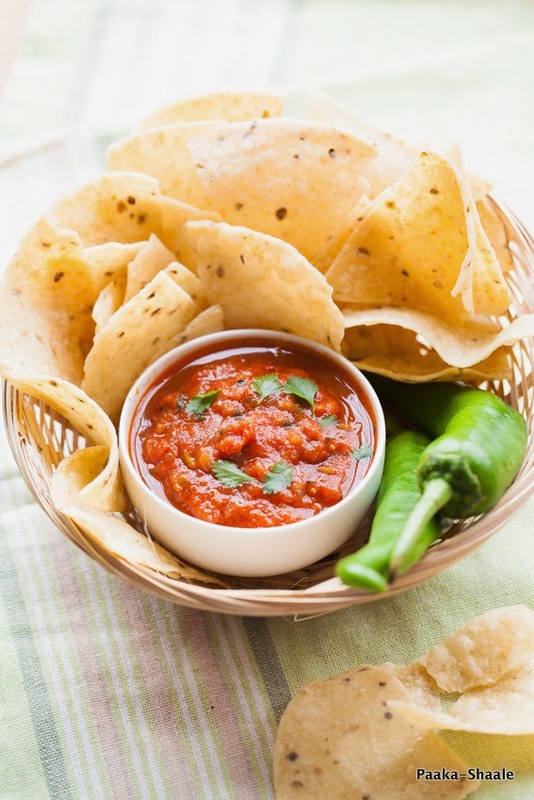 Despite the heat, this salsa is oddly addictive. So addictive, that I find myself heating it straight from the spoon. All I need is some tortilla chips and a perfect snack is at my disposal. Preheat the oven to 200 C. Grease a shallow baking dish with 2tspns olive oil. Place the tomatoes, onions, chilies, bell peppers cut side down. Also place the garlic cloves and carrot pieces in the dish. Brush the remaining olive oil over all the vegetables and sprinkle 1/2 a tsp of salt. Broil in the preheated oven in the top shelf for 15-20mins until slightly charred. 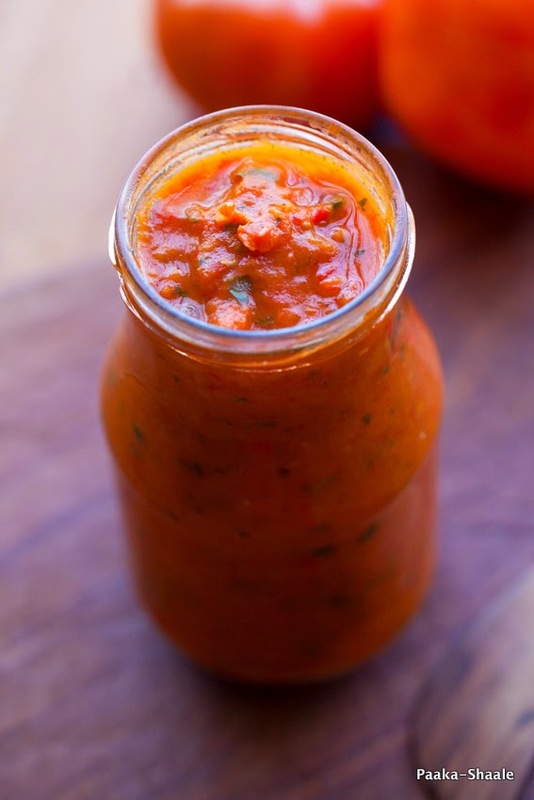 Allow the vegetables to cool completely before transferring to a blender jar. Add the rest of the ingredients, except for the coriander leaves and blend till slightly chunky. Add the coriander leaves and pulse for a couple of times. 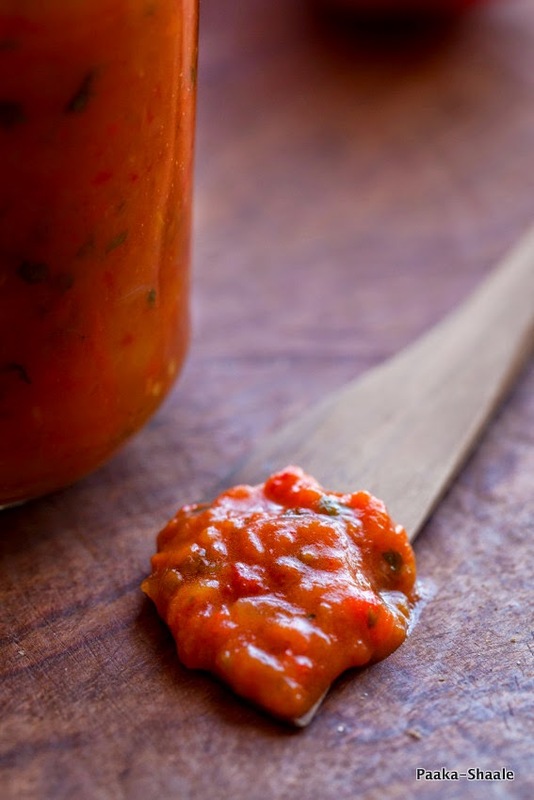 Transfer the salsa to a clean jar and allow the salsa to stand in the refrigerator for at least three to four hours or over night for the flavors to enhance. If you feel the habanero chilies are too spicy for you then simply substitute them with 2-3 jalapeño chilies. 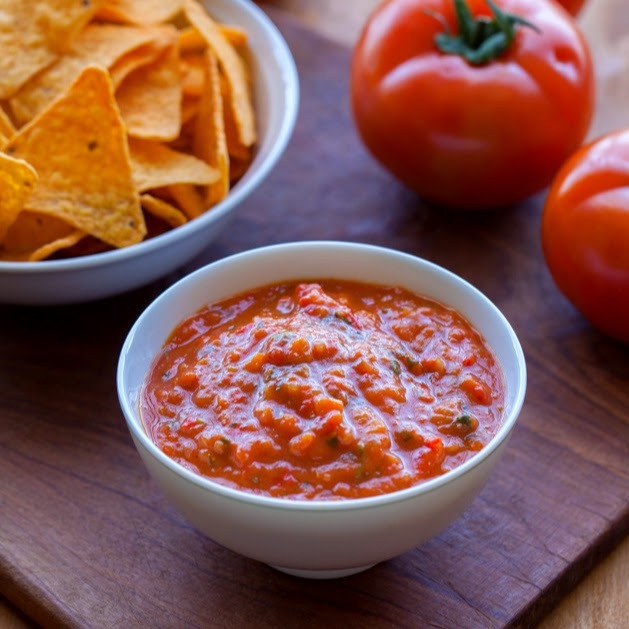 I felt the orange juice gave a pleasant sweetness to the salsa. You can omit orange juice if you want to. The taco seasoning mix can be substituted with a teaspoon of cumin seed powder and half a teaspoon of paprika powder. 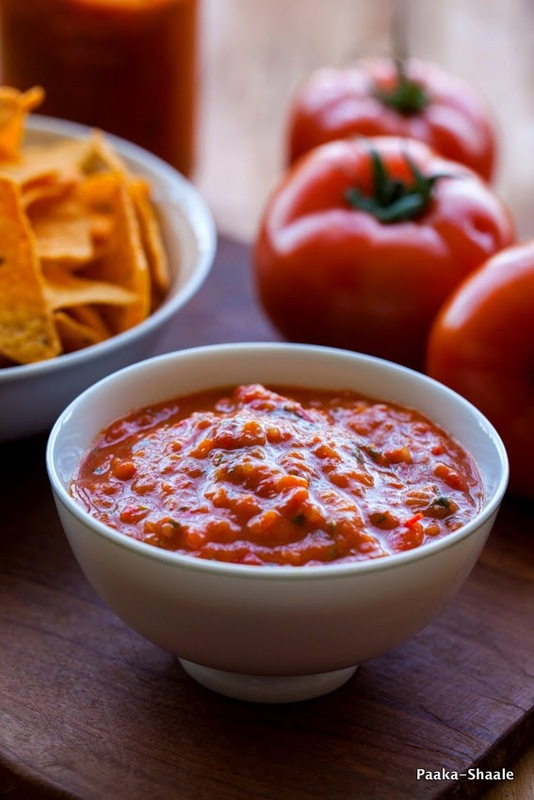 The you do not like your salsa chunky, then simply blend the ingredients for a few more minutes till the desired consistency has reached.